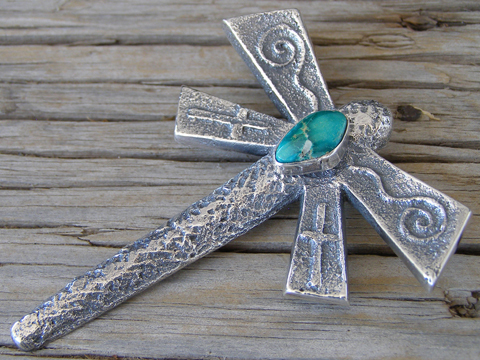 This is a beautifully textured sandcast dragonfly pendant set with a free-form stone of natural, untreated Broken Arrow Variscite from Nevada. The dragonfly is a symbol of everlasting life in Native North American lore. Gary makes these in various sizes, but this is the largest size we've seen him make. This has a shepherd's hook on back to string it on a chain or cord. We provide a leather cord for wearing this.